Followers of SummerFruitCup might have noticed a recent uptick in the number of gin reviews posted on the website; this is in a New Year endeavour to clear some of our backlog of gin reviews. Today’s mega-post has a theme: Colorado. Colorado is one of the top US states in terms of number of distilleries, along with Washington state, California, and New York. Should you ever be visiting the state, be sure to check out some of these great distilleries. Cap Rock Gin is made by Peak Spirits in western Colorado. It uses a base spirit made from local apples and a mix of 12 botanicals, including juniper, rose, and lavender. Nose: Fruity, rich and full. Distinctive notes of floral angelica and fresh-cut green apples. Taste: Smooth, with a fair amount of lemon balm and citrus, followed by fragrant and crisp green apple notes that linger and zing on the palate. There’s also a little dry angelica on the finish. Very unusual and rather fruity, with the jammy notes of apple sauce coming through, before moving onto more dry apple notes. A vibrant and delicious drink. Bright and crisp, with a mix of dry apple and pear flavours, before some juniper at the end. There is also a pinch of sweet spice, which adds balance. I’d recommend garnishing this Martini with a wafer-thin apple slice. This is a great take on the classic drink; the gin adds another dimension with its luscious fruit notes, adding to the cocktails typical bitter-sweet character; the sweet works well with the vermouth, whilst the bitter works well with the Campari. A very well-integrated cocktail and a drink I’ll likely return to. Cap Rock is a fun gin – great for those who want to try something a bit different, it is also a great example of how a non-NGS base spirit can work wonders in gin. My favourite drink was the Negroni, but all that I tried were very good. Produced at the Mystic Mountain Distillery at the foot of the Rocky Mountains in Larkspur, Colorado. Nose: Soft and vodka-like; a bit of vanilla, but not much else. Taste: Very smooth and clean. The grain base is apparent, but there is almost nothing else there. The vaguest whiff of juniper does start to come through, or perhaps I just imagined it. Almost void of flavour, this has a finish that is very dry, sucking the moisture from the mouth. Adding a little water, a faint orange character emerges. This is an unfortunately cloying drink, although not without a refreshing quality. The gin’s flavour needs to be emboldened to allow the spirit to stand up to tonic. I use British Schweppes, so I imagine that it would be utterly lost against a HFCS-based tonic. If this was a vodka Martini, it would be excellent: clean and smooth, with a good texture and a tiny hint of lemon citrus. But as a gin Martini, this sadly falls short; it has a dry finish, but no discernable juniper. This is a clean and somewhat refreshing drink, but the gin is totally lost to the other ingredients. There are some definite good points about Colorado Fog Gin: the base is of good quality in terms of texture and background character and the spirit has little burn or unpleasant stewed flavours. Unfortunately, it really lacks any discernible botanical character and as such I struggle to consider it as a gin. The best way to drink it was in a Martini – especially if you like vodka Martinis. Produced by the Colorado Gold Distillery in Cedaredge, Colorado, the distillers of this gin use local grains to produce their spirit base in addition to local water. Nose: Sweet grain, beer, and coriander. Taste: The sweet base comes through again on the palate: it’s quite bready, with herbal notes such as fennel and anise before dry juniper and a fresh finish of sweet citrus. A drink with a strong nose of pecans and pear. The taste begins with a little malt and hops, which transforms into notes of pecan and almond, before some sweet marmalade citrus. The finish is nutty and very dry. Certainly an unusual Gin & Tonic, but nonetheless refreshing. This is almost like a white whiskey Martini, full of grainy, bready notes. It’s dry and clean, with fine notes of juniper and coriander, plus a stem, plant-like quality on the finish. Colorado Gold Gin makes a mellow Negroni that, thanks to the base spirit, has a character reminiscent of geneva. There are some particularly bitter, dry, tannin notes, plus some herbal elements. An unusual, but cosy cocktail with a curbed bitterness and lingering sweetness of anise and fennel. Colorado Gold is certainly a very contemporary gin; with a lot of its base spirit coming through, the slightly sweet spice may well be too much for some traditionalists, but I enjoyed it. My favourite drink was the Negroni. A product of Mile High Spirits in the city of Denver, this gin is produced in a large glass still. It is made using botanicals that include: juniper, citrus, coriander, and Grains of Paradise. Nose: Clean, with a generous dose of juniper, plus citrus and earthy notes. Taste: A classic style of gin, but with a modest sweetness, this has plenty of juniper, as well as a pleasant mix of lemon and lime, all followed by some earthy notes. This is an excellent gin with both good texture and flavour. The drink has a light louche to it, plus a strong nose of pine. To sip, it is an extremely crisp, crystal-clean drink: there is refreshing juniper and citrus, plus the the earthy, floral flavours of angelica. A really good drink that ticks all the boxes. Very oily and, again, the drink louches slightly. Nonetheless, it is easy to drink and has a wide variety of signature classic gin flavours, all rounded off with a sweet spicy lift at the end of the finish. This is a Negroni with a fine interplay between bitter and sweet. There are notes of zesty citrus, plus the dryness of cedar and pine, before, once again, the drink is brought to a close with the gin’s signature spicy flourish. Denver Dry Gin is a first-class example of a truly classic London Dry Gin and is probably the best I have encountered that is produced outside of the UK. All of the drinks were excellent, but my favourite was the Gin & Tonic. Dancing Pines Distillery is in Loveland, Colorado, a little north of Denver. Their gin recipe uses just six botanicals. Nose: A nice bright nose of juniper and lemon, along with a tinge of sweet, but pronounced alcohol. Taste: Nice balance. Quiet upfront, building to a moderate level of juniper with an anise and fennel seed mid-note. The finish closes with a tinge of lemon, which is long and lingering. It has the character of a mild, but quite flavourful gin. Very crisp, clean. There’s a reasonable balance of flavour, with some citrus notes, and a particularly dry finish. An okay Gin & Tonic, but not great. A cocktail with a spicy and savoury element on the nose. To drink, this is a very smooth Martini, with silky notes of fennel/anise coming through, accompanied by dry pine and a citrus finish. Very nice. Dancing Pines makes a soft and clean Negroni with good spice and citrus notes, as well as hints of floral and vanilla. It is less intense than some other Negronis, but nevertheless has a good, if subtle flavour. Very easy to drink. Dancing Pines is a subtle gin that makes good use of its botanical flavours. My favourite drink was the Martini. Today’s review looks at the first of two gins from Spring 44 Distillery in Loveland, Colorado. Rob’s Mountain Gin is a limited edition spirit; each edition has a different formula, this was Formula #44. Nose: Zesty, with notes of coriander, lemon, and lime, as well as a hint of black rubber. Taste: Smooth and very creamy, with herbal notes and a silky note of citrus vanilla. The finish is lovely and dry, with lots of juniper notes. This gin has great balance; a splendid sipper. A drink with a spicy, complex nose, this Gin & Tonic has plenty of juniper upfront, which gradually gives way to sweet spice and more herbal notes. Thick and full of flavour; there are plenty of herbal and spiced notes, as well as some citrus, fennel, and anise, and more of a sweet note towards the end. Sophisticated and flavoursome, this is a delight to drink. Excellent – well-rounded and full-bodied, with a rich, slightly jammy, but bitter finish. The finish has a real, long-lingering bitterness that is complemented by the cocktail’s herbal character and tangy citrus. Rob’s Mountain Gin is a truly first-class spirit that is delicious either on its own or when mixed. My favourite drink was the Martini. Nose: Lemon, rose, and spicy coriander. Taste: This gin has a thick, mouth-filling texture and is absolutely packed full of luscious juniper: fruity and jammy, with a lovely freshness. The finish has more zesty notes of coriander, plus spice and pepper. Lively, with plenty of citrus notes, plus hints of lemongrass and coriander. Light, bright, and very thirst-quenching. Another satisfying cocktail that is clean and crisp, with an icy shard of juniper, coriander, and citrus flavours. A Martini with a booming character, this is superb. Textbook. A good, intense Negroni with a solid bitter-sweetness, as well as notes of citrus, juniper, and an array of earthy botanicals. Very good and definitely one that will please Negroni traditionalists. Overall, Spring 44 is a well-made gin with a good character and flavour-integration. My favourite drink was the Martini. Spirit Hound Gin is made by Spirit Hound Distillers in Lyons, Colorado. Their juniper is sourced from the local area by patrons of their bar, where one bag of juniper berries = a free drink. As such, the varieties used vary, but will likely include both Juniperus Communis and Juniperus Scopulorum. Spirit Hound distill their botanicals using a vapour basket and their mix includes: juniper, cinnamon, anise, cardamom, and clove. Nose: Juniper that’s accompanied by fruity notes such as watermelon and cantaloupe. There is also some cucumber notes. Exceptionally fresh. Taste: Initial citrus flavours lead onto those of sweet spices such as cassia, nutmeg, and cardamom. The piney, juniper finish lasts for a good while and contributes to what is generally a good, thick texture. Spice and nutty notes come through: sweet anise and fennel, as well as cinnamon, a hint of nutmeg and cardamom, as well as a hint of sassafras. The spice notes are warm, but the drink is still refreshing, especially with a citrus wedge as garnish. Strong notes of liquorice, anise, cinnamon, fennel, and cardamom came through well. This is a slightly sweet and very spicy Martini. I think a lemon twist would be the best garnish. Very smooth and well-rounded. A full-flavoured drink with warm spice in the middle and an intense bitterness at the end. Clean, fresh, and revitalising. A refreshing gin with a complex character. My favourite drink was the Martini, although all of the drinks were excellent. Wood High Mountain Distillery make a range of spirits from their site in Salida, Colorado, including single malt and rye whiskies, elderflower liqueurs, and both aged and unaged gins. Nose: Juniper, cassia, cinnamon, and some salty fennel. Taste: This has a smooth texture to start, with more spicy pepper towards the end. There are, however, some spicy notes to start with: nutmeg, cinnamon, and fennel. This is a pretty spicy gin, with a dash of sweetness, but is nevertheless very smooth. It has many of the flavours that I would associate with an aged gin: the sweetness, the spice. Zesty citrus to start, followed by warm vanilla. This is a spicy Gin & Tonic with a little sweetness in the middle, before a dry finish of refreshing pine. A Martini with a silky mouthfeel, this is well-rounded with juniper and spiced notes of fennel, anise, and nutmeg. It’s a splendid drink and an excellent example of a more contemporary Gin Martini made with an American Craft Gin. Plenty of sweet anise upfront, but with lots of other flavours, too, such as citrus and spice. The drink almost tastes as if the glass has had an absinthe rinse. It has a great flavour profile and a superb bitter-dry finish. Woods Treeline Gin is a lovely, complex gin that makes some cracking cocktails; my favourite was the Negroni. One of the few places that I have visited more than once in the US is the north-west city of Seattle; in fact, I once visited it twice in as many months. The city is a hub of distilling and some superb distilleries are located there. Examples include: Copperworks, Sun Liquor, Sound Spirits, and, of course, who could forget the fantastic Captive Spirits, producers of BIG Gin. Fremont Mischief Distillery is located in Canal Street, where they make a range of spirits, from vodka to whiskey and, of course, gin. Fremont Mischief Gin is bottled at 40.0% ABV. Nose: Zesty citrus and fresh, aromatic spice: coriander, nutmeg, and cassia. Taste: Vibrant, with more spice upfront, then piney juniper that leads onto bright citrus. Hints of violet precede a dry, slightly bitter, finish. A brilliant drink with a charming interplay between juniper-jelly and spice. There are vibrant cassia, luscious citrus, and wonderful cardamom notes, too. Fantastic! Silky smooth – a luxurious texture – with a variety of spice: cardamom, cassia, & nutmeg. Bright pine needle notes follow, making this a really lovely drink. Fremont Mischief Gin makes a particularly spicy Negroni, with the sweeter notes of the gin and vermouth neatly balanced by the bitterness of Campari. As is evident from the tasting notes, I think that Fremont Mischief is a pretty fantastic gin. It is full of flavour and has a variety of botanical nuances: citrus, herbs, spice. The result is a sippable and very mixable gin. My favourite drink was the Gin & Tonic. Dancing Trees Gin is made by the Dancing Trees Distillery (now know as Fifth Elements Distillery) in Meigs County, Ohio. The distillery was founded by Kelly Sauber in 2011, who started off twenty years earlier as a home-brewer. They currently make a gin, two vodkas (one grain-based, one grape-based), and a coffee liqueur, and they are passionate about using local ingredients. The gin is made using Spicebush Berries and Organic Rosehip as part of its botanical mix, has a grain spirit base, and is bottled at 40%ABV. Nose: Grain notes, as well a hint of grape and pear. There’s also a vanilla sweetness, followed by dry pine. Taste: Smooth and thick, with a silky mouthfeel, notes of dry almond and apple/pear come through, mixed in with a restrained sweetness. There’s a hint of coriander accompanying the juniper notes, before a long finish that fluctuates between sweet and dry apple notes and some nuttiness. All-in-all, complex and engaging. Very dry, with notes of almond, pear, and pine. Despite the dryness, there is a confectionery aspect to the drink, somewhat reminiscent of a pear and almond tart, but it isn’t too sweet. Rather unusual, but nonetheless clean and refreshing. Herbal coriander comes through on the nose. To taste, there are flavours of juniper and dry apples (like Calvados), plus a little coriander and fennel, and a dark, sweet treacle note, which results in the cocktail being slightly reminiscent of dark naval rum. The finish is long and bitter. Great – not too sweet and not too bitter, with pine notes accompanied by chocolate and a light nuttiness. All of the flavours are well-balanced, making it a real treat to drink. There’s little more to say, except that I am impressed and this is a sound drink. Dancing Trees Gin is a dry gin with a good deal of fruitiness to it that brings some different and unexpected flavours to familiar cocktails. My favourite drink was the Negroni. Cocktails with the new Barrel Reserve and Peat Barrel BIG Gins – from the USA! As 2016 approaches, I thought that today I would share with readers two 2015 releases from one of my favourite distilleries; not only do they make delicious, award-winning products, but the owners are a hoot! I speak, of course, of Captive Spirits: Ben Capdeville, Holly Robinson, and the entire Big Gin family. In 2014, Bourbon-Barreled Big Gin won Best Contemporary Gin at the IWSC and now the folks at Captive Spirits have released two new aged gins. Barrel Reserve Big Gin is aged for Three Years in Ex-bourbon (Heaven Hill casks). Peat Barreled Big Gin is rested for 3-4 months in Westland Distillery’s American Single Malt Peated Whiskey barrels (which previously held Wild Turkey) and is bottled at 47% ABV. Nose: Light fruit and vanilla. This is sweet and inviting, before a hint of pine blossom towards the end. Taste: Delightfully smooth and sippable, this has a lovely balance of the complex, sweet wood spice and the dryer, piney gin notes. It also has a thick texture that fills the mouth and the menthol pepper of the Tasmanian Pepperberry on the finish. This gin chills down well, adding a lovely viscosity to the texture. Upfront, there are notes of toffee and spice, with some crisp pine and citrus, too. The finish is more floral, with sweet spice and wood; it’s creamy, before a peppery finish. Herbaceous and woody; this is quite resinous, but the lengthening of the soda gives the gin a lighter, refreshing character without compromising on intensity or quality. Sweet, fruity, and jammy, with a touch of bitter herbal notes. Then comes some spice and vanilla, and a lovely, creamy finish. Wow! Simply fantastic – there is an excellent synergy between the gin, the wood, and the other ingredients. Smooth, mellow, and relaxed, the gin takes the drink to another level, with beautiful vanilla wood and maple notes in the middle. A must try! Nose: Light spice with a wisp of dry, smoked wood, then a little citrus and cedar. This is complex and evolving with a few subtleties kept back for the palate. Taste: The wood creates a very dry, light smoke that lingers and builds as you sip. The dry wood notes work well with the fundamentally dry character of the gin. After the wood comes some juniper, angelica, and a little citrus. The finish is of spice and the slight menthol pepper of the Tasmanian Pepperberry. Dry, with flavours of apricot kernels, followed by flavours of fragrant cedar. Excellent, cooling, and sippable. The woody notes are dry, adding to the refreshing nature of the drink and complementing the other botanical notes, whilst the spice adds complexity. This is, without a doubt, an aged gin made for soda. Superb – light and dry, almost as if it was made with dry vermouth. Despite that, there’s a lovely sweetness at the end, along with delicious, rich orange notes. This is truly excellent and sets itself apart from other Sweet Martinis. A wonderfully woody Negroni: the smoky wood works really well with the bitterness of the cocktail and here is a touch of very dark chocolate thrown in, too. All of this is balanced by the sweetness of the vermouth and the extra bitterness of the Campari. Another excellent drink. It’s great to see the folks at BIG Gin not rest on their laurels after their big win at IWSC with their first Bourbon Barreled Big Gin. These two new additions are no fly-by-nights and have obviously been well thought through before their release. The Barrel Reserve adds smoothness and complexity to what was already a great gin and really starts to bring aged gin in line with some of the better whiskies that are great to sip and explore neat. The Peat Barreled Gin achieves a fine balance between gin, wood, and smoke and, whilst the peat is certainly there, it does not overwhelm the gin’s character; in addition, the extra woody, smoky dryness that it adds is – I think – fantastic. I highly recommended trying both. Made at the Double V Distillery in Battle Ground Washington State, USA, Griffon Gin is grain-to-glass; that is, they distill the whole product themselves, including both the base spirit and the redistillation of botanicals. The base is made using a mix of locally grown corn (80%) and barley, and their botanicals include juniper, coriander, and cardamom. It is bottled at 40.0% ABV. Nose: Creamy and sweet with a touch of stickiness to start, but then there are some dryer, floral (lavender) elements that are followed by stalky, vegetal notes. A tempting aroma that encourages you to take a sip. Taste: Coriander and light citrus upfront, followed by spice (cardamom) and then some dryer notes. The spirit is relatively smooth, although there is some warmth, along with more citrus, on the finish. This is quite a sweet Gin & Tonic with a lots of spice; cardamom is the most dominant, but there is also ginger, cassia, nutmeg, and cinnamon. Citrus and a bit of dryness comes through at the end. Fresh and tasty. Clean, with lovely pine notes and lots of spice. There are hints of cedar wood, vanilla, cinnamon, nutmeg, and cardamom. Very tasty and complex. Delicious. Another spicy cocktail, this time with some crisp, fresh notes, too. This is a well-integrated drink with a bitter finish, but one that is curbed slightly by the hints of cassia. Delightful – near perfect. Whilst Griffon is certainly a very spicy gin, the spice does not dominate the entirety of its character and other elements, such as the citrus and pine/juniper, add balance. All of the drinks that I tried were excellent, but the Negroni just takes it for me. I’ve often written about the renaissance of craft distilling in the US, but the availability of these products has always been rather limited. However, last week, a new gin brand arrived in the UK, being imported from America by GX Spirits. 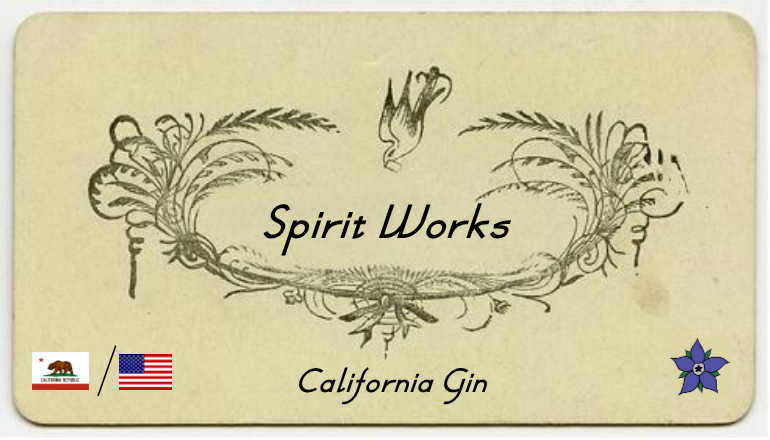 That brand is Spirit Works, out of Sebastopol, north of San Francisco, California. Spirit Works was founded by husband and wife team, Timo & Ashby Marshall. Timo originally hails from England, whilst Ashby is a native of the Pacific West Coast. Their current range includes a gin, a vodka, and the only US sloe gin made in the traditional, English style. Batch 004 from November 15, 2013 – you can check out when your batch comes from on the Spirit Works website. Nose: Juniper with hint of lemon and vanilla. Taste: Juniper and spice up-front, which moves onto a stronger pine flavour intermingled with a sweet breadiness with a touch of fennel or caraway. There’s also bright citrus and a little pepper towards the end. A good, solid dry gin with a little transatlantic flair. Very nice to sip neat, on the rocks, or from the freezer. Fruity, with notes of vanilla and a dry, refreshing finish with a lot of flavour. Classic, with a creamy twist. I am reminded of jelly and ice-cream, but by no means in a bad way; the drink is not overly sweet and has a dry finish. My advice: try one. This cocktail has a lovely interplay of flavours between dryness and crispness. The juniper is certainly there, as well as dry floral and citrus notes that work well with the vermouth, but be careful not to put too much in. Just before the finish there is a burst of plumy fruit, which stops the drink from becoming too arid. The finish is long, lingering and dry and, as it fades, you are more than inclined to take another sip. Lovely nose – some hints of vanilla and cinnamon, like homemade custard. The taste is even better, just superb – a lovely interplay of flavours between the spicy botanicals, dry botanicals, and its sweeter elements. Complex, intense and a delight to drink. Spirit Works, Website, Twitter, Facebook, UK Distributor. With the rise of craft and micro-distillers comes an increased desire to innovate and experiment in search of a gin that breaks boundaries and sets itself apart from the crowd. An increasingly popular way of doing this is to use a non-typical base spirit (i.e. not Neutral Grain Spirit). Often, the base spirit used is inspired by what grows around the distillery and one such example is apples. There are apple base spirits in use throughout the US and the William Case Gin of the UK also uses an apple base. Nose: Spiced apple with juniper, angelica, and some lovely, warm spiced notes: cinnamon, nutmeg, and cassia, as well as fruity raisin. Warm and inviting. Taste: A lovely, smooth spirit with the apple working well with the dry botanicals (juniper, angelica); this is then balanced out by some of the sweet, baking spice notes, which are somewhat reminiscent of an apple crumble or baked apple. The base comes through strongly, giving a dry apple flavour that’s followed by a flair of gingerbread spice, although this is slightly more subtle than the flavours of the gin on its own. The finish is dry, with some bitterness from the quinine and juniper that stops the drink from becoming too sweet. A spicy Martini with citrus (orange and lemon) and spice, including cinnamon, nutmeg, cassia, and even a hint of vanilla. It’s a little like some kind of cinnamon bread, but one that is, thankfully, not too sweet. All-in-all, this is a smooth and viscous Martini that I’d happily have again. Another delightful Bellewood drink. This is full of fresh, crisp apple notes, as well as piney juniper and cinnamon spice, which work well with the cocktail’s other ingredients to create a tasty drink that’s full of flavour. 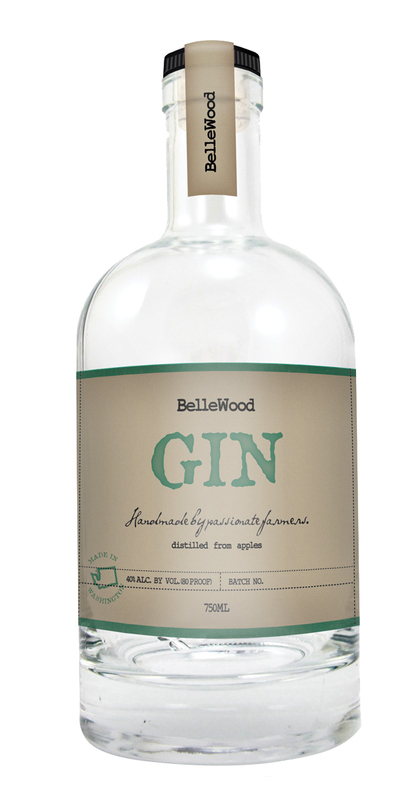 Bellewood is an exemplary example of an apple-based gin. Depending upon how it’s mixed, different aspects of the spirit came through – a sign of good gin. My favourite cocktail was the Martini.